The Continental World Postage Stamp Album, 1990 ed., published by the U.S. Fulton Publishing Co. Countries of the world A- ABU DHABI - Z- ZULULAND. All stamps pictured are black & white images, with hundreds of illustrations. 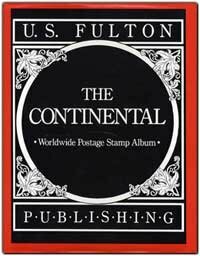 The Continental World Postage Stamp Album, 1990 ed., published by the U.S. Fulton Publishing Co.
Two (2) post binder. Binder size: 9.5x12.5x1.75". Album pages are 9x12". 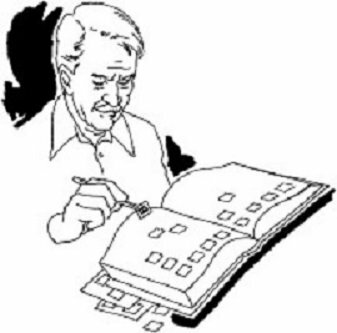 Album contains 140 two-sided pages, or 280 pages. All stamps pictured are black & white images, with hundreds of illustrations. Blank space available to add additional stamps for each country. Countries of the world A- ABU DHABI - Z- ZULULAND. Most of the country and regional maps used in this album were provided by P. C Globe. Please note that this album weighs three (3) pounds, and does not qualify for USPS Media Mail, and is too heavy for USPS First Class Mail. Shipment with USPS Priority Mail.